Chhath Puja is a Hindu festival which is celebrated every year in India with great enthusiasm. This is a very ancient festival which is also called Dla Chhath, Dala Puja, Surya Sashthi, in which Lord Sun is worshiped. At the same time, people wish from the sun for happiness, peace, prosperity for their family. According to Hindu culture, people desire the sun to be disease-free nd healthy. Chhath's rituals or worshipers rise very early in the morning on that day. Those who live near the Ganges river take a holy bath in the Ganges and those who live in many places of India take a bath in the rivers or ponds. They fast throughout the day and do not drink water all day long. Those people who worshiped on that day stand up to half a body in water for a very long time and look forward to the sunrise. Chhatta Puja is celebrated in many states in India like Bihar, Uttar Pradesh, Jharkhand, and Nepal. According to the Hindu calendar, Chatha Puja is celebrated on the 6th day of Kartik month. Some places are celebrated even after Holi in the sixth Chhath, Chaitra month. Chhath Puja is of great importance in the festivals of India. In the ancient times, King Maharaj was invited to be priests, especially to perform this pooja in the state. In addition to the havan kund as well as to worship the sun god, he used to pronounce the monuments of Rigveda. It is said that Chhath Puja used to do Draupadi and Punch Pandav of Hastinapur to get rid of their misery and to regain their lost state. 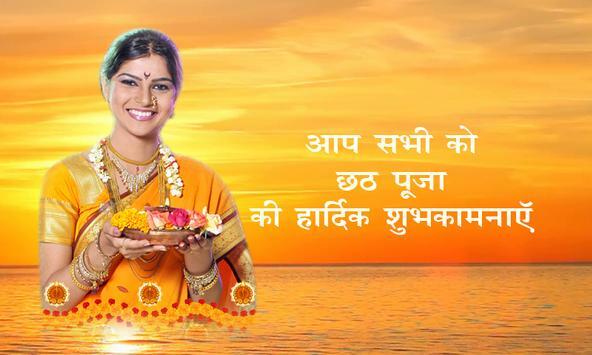 Chhath Puja was first started by the sunputra Karna. he was brave and powerful. It is also said that during Mahabharata, he becomes king of Angk Desh (Munger District - Bihar). 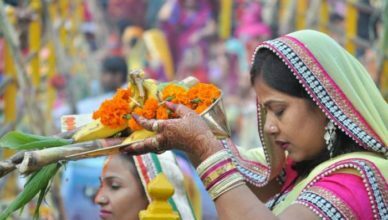 On Chhath Puja, the worship of Chhathi Maiya i.e. Sun God's wife is also done. Chhathi Maiya in the Vedas is known as Usha. Usha means the first light of the day. Their worship is done on the day of Chhath, seeking salvation and wished to solve the difficulties. Another story related to history is that Lord Rama and mother Sita thanked for the arrival of Van was for 14 years of exile in the month of Kartik, had fasted and had worshiped the sun god. It was a long time ago, there was a king whose name was Priyavrat and his wife's name was Malini. They lived very happy, but there was a great sadness in their lives that they had no children. They have made a very big sacrifice with the help of Maharishi Kashyap for getting the child. Rani Malini was pregnant due to the boon of sacrifice, but in the ninth month she gave birth to a dead child. The king, after seeing this, lost his senses and started thinking of committing suicide. Due to their misery, Goddess Khashanti appeared and said, "O King, stop worrying." The person who performs my worship with a true heart surely gets a child. Upon hearing this, King Priyavrat did austerity, due to which he received a beautiful child. Since then, people have started to worship Chhath. It is believed that during the time of Chhath Puja, devotees leave their families separately, i.e. follow some different rules. Since the first day of the holy bath, they sleep on a mat or blanket of bread on the ground. Once the person who started Chatha Puja has to follow the rules according to the rules. Only a person can stop doing it in any year if a person of his family has died in that year. Devotees offer sweet, kheer, khukua, and fruits to Suryadev. Prasad should be made without salt, onion, ginger. Chaturthi - In the first day (Nahay Khay), the devotees take a holy bath in the river and bring some water from there in a vessel to make other materials. They keep neat around the house and eat a pumpkin meal once a day and start the Maha Parv Chhath. The food should be made of any brass and clay utensils and must be made with the help of mangal wood in Chuleh. Panchami - On the second day (Lohanda and Kharna), devotees fast on the day and break their fast in the evening only after sunset. They promote rasins-kheer, whole and fruit in worship. After eating he does fast for the next 36 hours without water. Shashthi - On the third day (Sandhya Arghya), this day is the day of Chhath. On this day in the evening, all the devotees worship God on the banks of the river. After that, they wear the turmeric-colored sari and the family members celebrate the ceremony of Kosi, in which they put the five cane wings on their cherries. Five cane rods are considered the form of Panchatattva (earth, water, fire, air, and space). Saptami - On the fourth day (Usha Arghya, Parana Day), on this day, devotees present Bihaniya Arghya in the Ganges river along with their families and friends. After that, they break their fast and accept Chhath Prasad. If you liked this information related to Chhath Puja Maha Parve, then definitely share and tell us through the comment.